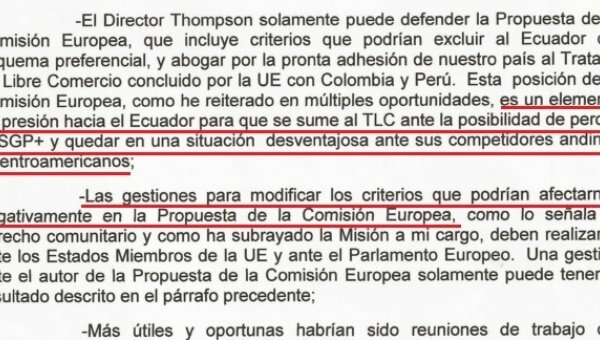 A document leaked today shows that Ecuador’s government was threatened with isolation and a devastating loss to its trade if it didn’t return to the negotiating table for the EU-Andean Trade agreement. The European Union twisted Ecuador’s arm, threatening it with isolation and loss of its trade preferences if it didn’t sign the EU-Andean Trade Agreement, it was revealed Thursday. 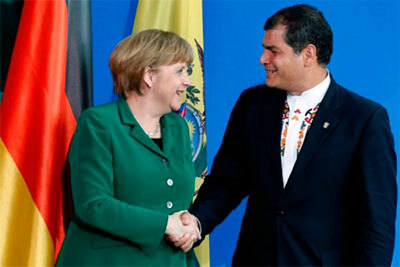 Ecuador signed the Agreement July 17, after four years of negotiation. Had it not, it risked losing the aforementioned EU preferences framework — freeing developing countries of duties — which would have cost Ecuador US$1.2 billion, according to a study by the U.N. Economic Commission for Latin America and the Caribbean. Perhaps showing just how far Ecuador’s resistance to signing the agreement has gotten them, Minister of Foreign Commerce, Francisco Rivadeneira, told journalists at a press conference that Ecuador had achieved “unprecendented” concessions. “We were obligated to negotiate, but we negotiated hard,” Correa said in the above interview. Find out more about the agreement in our in-depth article, coming soon.